Hi guys! How’s it going? Ready for a cozy, mouth-watering dish? 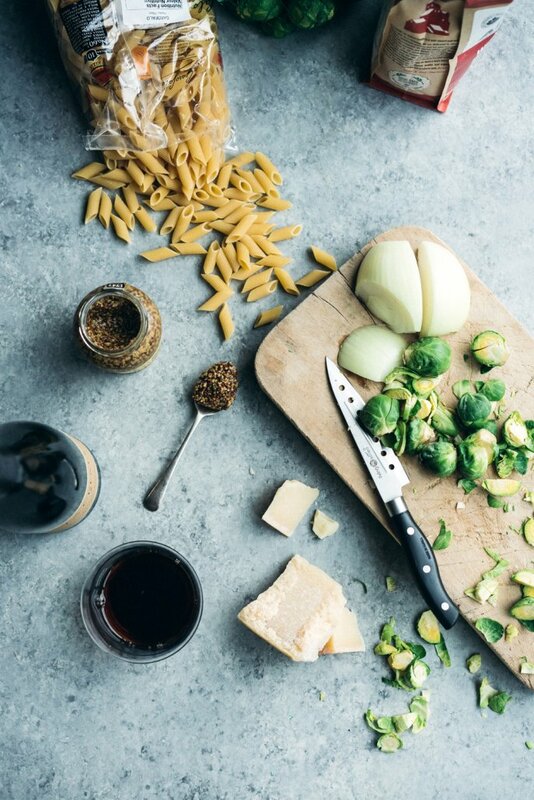 Today I’m sharing a recipe to make a stellar mac and cheese that will definitely make it to the top of your “I wanna eat this all winter long” list. 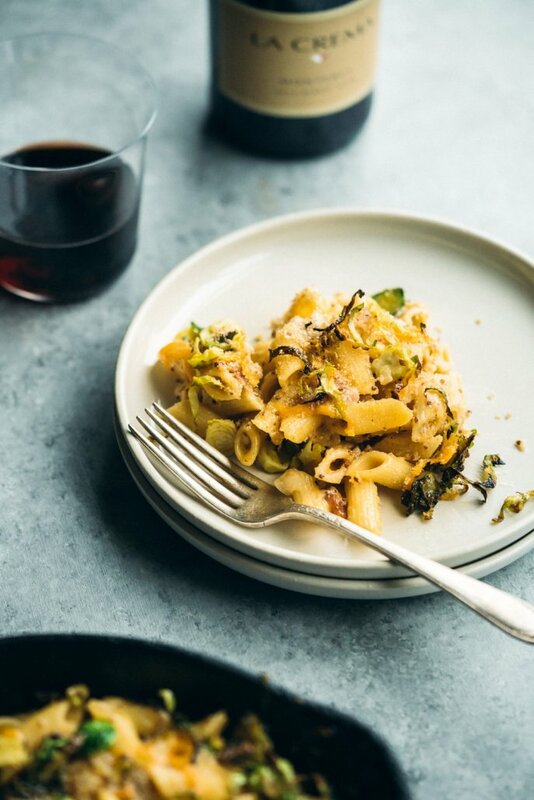 This recipe has lots of cheese, a touch of mustard for heat, a super nice creamy texture and it’s all topped with crispy brussels sprouts, I mean, this is comfort food at its best! If you are one of those peeps that’s not a big fan of brussels sprouts, I bet it’s because you’ve eaten them the wrong way. I used to keep them at bay since I thought they were the most boring winter veggie ever. That’s because most times I tried them they were soggy and totally lacked flavor. The secret to make them tasty is to season the crap out of them AND make them crispy, that way they are crunchy on the outside and a bit soft on the inside. Add some cheese and pasta and they’ll be your new fave sidekick. 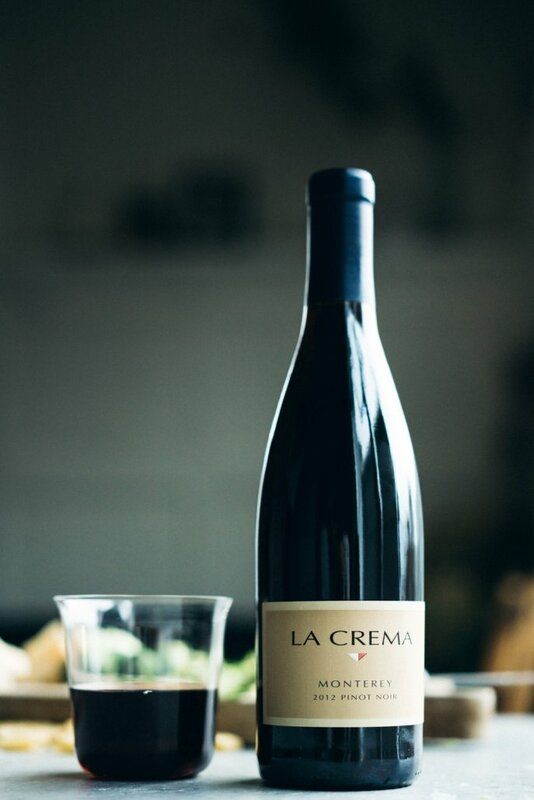 Now since we are all about being cozy, I decided to pair this dish with a red wine, something rich with a nice touch of spice, in this case La Crema’s Monterey Pinot Noir. This Pinot has a good level of acidity that will go very well with the richness of the mac and cheese. I like because it’s not crazy bold, it’s very sip-able, and it’s perfect for a glass before (and during) dinner. Ok so, let’s get this mac and cheese ready, shall we? 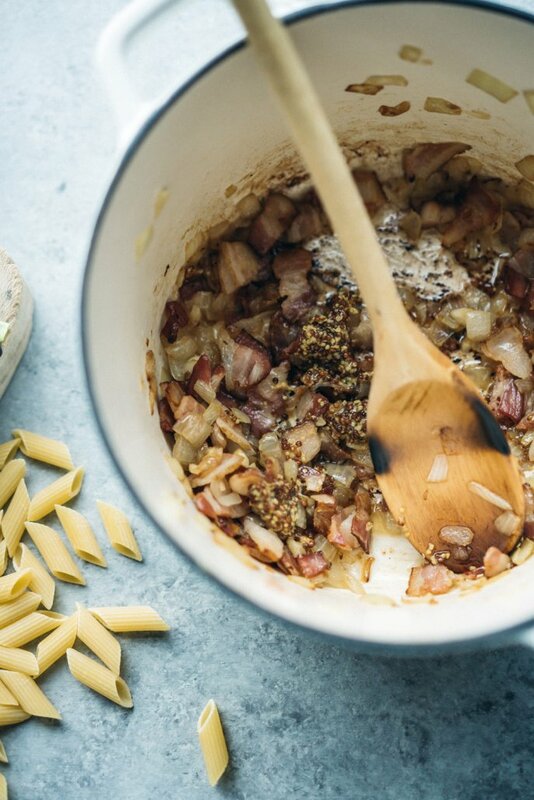 Grab a cast iron pan or other heavy-bottom pan and place it over medium heat, add the bacon and slowly start to cook, once the fat starts to get rendered, add the onion, garlic, mustard, and chili flakes. Cook until onions are translucent, about 3 minutes. Add the flour to the cooked onions and stir to create a roux, if it’s too dry add a touch more of olive oil. Cook the rough until flour starts to brown a little, about 2 minutes. Slowly, while stirring, add the milk making sure that flour dissolves all the way. Stir for 3-4 minutes, then add the cheddar and parmesan and stir again, reduce the heat to low and let it simmer for 2-3 minutes, season with salt and pepper. Preheat the oven to 350F and prepare a cast iron pan or a other baking dish spraying it with non-stick spray or a bit of oil. Cook the pasta, strain, and add it to the cheesy mix, stir it in. Taste for seasoning and adjust if needed. Set aside. 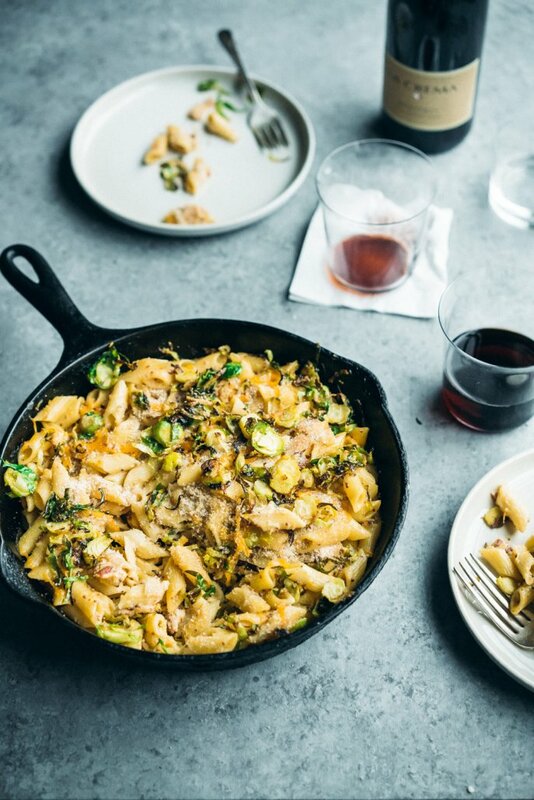 Now place the mac and cheese into the baking dish or cast iron pan, then top with breadcrumbs, fried brussels sprouts, and a sprinkle of freshly cracked pepper. Bake in the oven for 10 minutes, then finish on the broiler for 1 minute.